Cut the rusty spokes of the old tubular wheels to separate the hubs from the Nisi rims. Disassembled and cleaned the hubs. Now I've got to polish all parts and put it together again with some new grease. Ball races and balls look excellent. 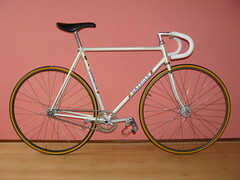 I've found a pair of clincher rims: Alesa 913 from Belgium, so that goes well together with the Superia frame kit. The rims are NOS (new old stock) shiny silver colour aluminium, 36 holes. The only thing that worries me a little bit is, that these rims are a bit too new for the bike. I think the rims are from the late 1980, but that makes that everything is still within a time bracket of 10 years, which is acceptable. Alesa 913 rims are a little bit higher/deeper than flat, box section rims. I think I've used these rims in the late 1980s when our road team was sponsored by Vredestein and Alesa. The aero-ish rims without eyelets were absolutely terrible, but the more box section like rims with double eyelets were much better. We used them in road races and it was the hard anodised black/grey version. 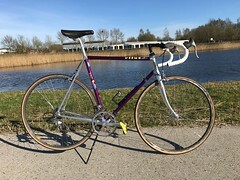 This silver version matches a lot better with the Superia frame with Dura Ace 10 series components. It's very hard to find a pair of 36 hole clincher rims with unworn side walls from the late 1970. Most rims have been used on road biked, so brake signs are visible. 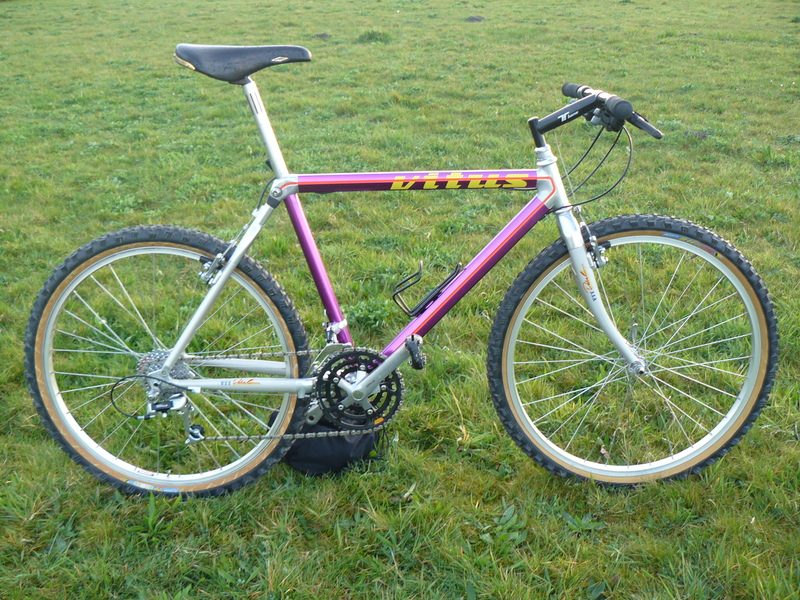 Nearly all track wheels from that era have tubular rims, but for practical reasons I want clincher rims. Spoke length calculators tell me that I need spokes of 288 mm. I've tried 290 mm, but that's far too long. I'm going to order 286 mm and I'm pretty sure that thas is correct. (Edit: 286 mm wasn't available. I've ordered 285 mm and 287 mm. 285 mm was a bit too short and 287 was correct. No idea if I will tie and solder the spokes. I'm already done that a couple of times. There's no real benefit, when you decide to do it, it mainly because of emotional and unlogical reasons. I will see.